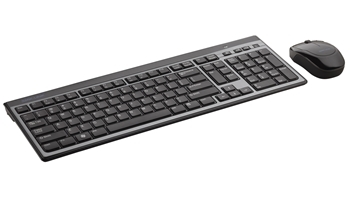 The VP6610 VersaPoint Wireless Slim Desktop Suite offers a wireless keyboard and a 5-button mouse for uncluttered desktop. A single USB receiver plugs into the desktop and offers cable-free ease of use up to 33 feet range without line of sight. The keyboard features slim scissor-switch construction with low profile keys to reduce travel distance and minimize finger fatigue. Three built-in hot keys and 9 function keys for navigating Internet, email and media controls provide additional productivity enhancement. The mouse offers an optical resolution of 1000 cpi and has five buttons for back and forward page controls. The VP6610 is great for lecture halls, classrooms, conference rooms or home office settings.